By Stalin’s death in 1953 the Soviet Union’s sciences were the largest and best-funded in history — and were at once the glory and the laughing stock of the intellectual world. Now it’s finally publication time, I thought I would return those favours past and invite Simon on to the Medium stage to tell us more about the triumph and tragedy of science in the Soviet era. Tom Hunter: At what point did you first realise the history of Soviet science would be the subject of your next book, why this subject and how long did you work on it? Simon Ings: Stalin and the Scientists grew out of my love of popular science, and these odd, self-conscious, incredibly rigorous bits of our world we lump together as “the sciences”. But I had no real vehicle for that enthusiasm until I got talking to Will Hammond, an editor at Penguin and, like me, a fan of the writings of Alexander Luria. Luria, who was born in 1902, is the soviet psychologist who is generally considered the founder of modern neuroanatomy and, thanks to books like Mind of a Mnemonist, the godfather of the literary genre we call popular science. Will and I talked about producing a new biography but the problem with Luria’s life is that, from a Western perspective, it looks absolutely normal. He had a successful international career, his work has never been out of print, he was loyal to his friends and his friends were loyal to him; he had a happy marriage. To have achieved all that under the regime of Joseph Stalin, while at the same time conducting cutting edge research with huge political implications, was extraordinary, but unless you know the context, the story is invisible. Tom Hunter: You also write fiction as well as popular science. Are these completely different creative processes for you as a writer, or do you find at the end of the day it’s still all about getting in the keyboard hours? Simon Ings: The processes are completely different. They have virtually nothing in common aside from the brute athletic business of smashing the words out. Fiction is, or should be, a pure experiment, a working hypothesis that gradually acquires an integrity all its own, however crazy it turns out. That’s true of certain kinds of non fiction as well, of course, but it most certainly is not true of popular science. Popular science is a more or less equal mixture of history and the kind of simplified, triumphalist whig-history you need to employ to make the science comprehensible. And whatever the proportions, that final mix can be tested against the world. In fiction, you ought to be drawing on your own resources, so far as you can, so far as you dare. When I write non-fiction I’m clambering about on the shoulders of giants. Tom Hunter: Is there a single best or favourite example you can share with us that might best highlight the story of Stalin and the Scientists for us? Simon Ings: Finding a reading from this book, I realised that the three key elements the extract had to somehow cover were achievement, naivety and dread. Soviet science, from genetics to ecology to psychology, and eventually extending to physics and space science, was extraordinarily accomplished. In so many fields at different times the Soviet Union led the scientific world. But most disciplines enjoyed their golden age when the government was weak, young, and driven by a sometimes clueless and often savage enthusiasm, and so many of the researches described here often ended in personal and professional disaster as the state’s enthusiasm for science turned dogmatic and overbearing. So the story of Ilya Ivanov, though a bit of an outlier, for me is a sort of emblem for the story of Soviet science as a whole. By the time of the 1917 revolution Ivanov was already an international celebrity — a pioneer of artificial insemination who had increased the breeding rate of horses at a time when horses provided most of the power available to agriculture. When he lost his Tsarist patrons, he looked for a research programme that would catch the eye of the new government’s Commissariat of Education. Which is why he came up with a proposal to cross-breed humans and chimpanzees. We now know there are immunological difficulties preventing the cross, but the cross itself is not at all a crazy idea, and Ivanov got funding from Paris and America to further the study. Ethically the venture was a disaster. It turned out that Ivanov had attempted to fertilise African women without their knowledge. The pre-revolutionary Academy of Sciences threw a fit and their upstart rivals the Communist Academy took advantage and seized control of the project, even as extreme negative eugenics was sweeping across Europe and making eugenics a poison chalice. Ivanov was got rid of during the Purges of the late 1930s thanks to a denunciation by an ambitious colleague; still the primate sanctuary he founded later provided primates for the Soviet space programme. So there you have it! Tom Hunter: On the one hand it seems popular science is becoming ever more, well, popular with readers, but at the same time one can’t help noting the ‘Britain has had enough of experts’ mentally that seems to becoming equally popular/prevalent. Simon Ings: Politically that’s certainly true. We’re doing this interview even as Donald Trump teeters on the brink of becoming President of the United States. But then, look at someone like Derren Brown: a hugely popular entertainer whose entire shtick is that he’s studied psychology enough to debunk charlatans. People are sick of *certain kinds* of authority, and that’s largely because the public’s always keen nose for hypocrisy has for the last couple of years been shoved repeatedly into a trough of social and immediate media. Quite frankly, we’re drunk on the stuff to the point of paranoia. A new balance will emerge fairly quickly. Authority will reacquire enough of its status to be useful, and will stand, please God, on a firmer footing. When it comes to the public perception of science I can’t summon much anxiety. I grew up in the heyday of Von Daniken and Holy Blood and the Holy Grail, not to mention the Hitler diaries. We survived. Tom Hunter: Continuing on the same theme, in your view will it ever be possible to decouple science from political influence or, the reverse, how might we better put science at the heart of driving policy rather than being subservient to it? Simon Ings: Scientific government is *exactly* what the Bolsheviks were about, and their sincere experiment destroyed the food base of an empire and set fields in which the Soviet Union was a world leader into mothballs for over thirty years. The last thing we should wish for is scientific government. Even talk of “evidence-based policy”, which we’re all supposed to be wildly enthusiastic about at the moment, makes my blood run cold, because at the back of it is the assumption that it is possible to gather reliable evidence from human society in real time. That’s a *really* big ask, and no amount of big data or surveillance is going to get around the formal difficulty of modelling an unpredictable system on the fly. In many cases, having more data makes the problem worse. So there’s always going to be this tension between politics, which is an historically contingent activity, and science, which as much as possible treats the world and everything in it as if it were a linear, symmetrical system. So, then, look at this the other way: can we ever actually *separate* science and politics? No. There’s no way citizens can be expected to simply hand money over to some scientific priesthood and expect *no* return for their investment. But the bitter truth is that any experimental activity is a hugely wasteful, and demanding rigid outcomes and takeaways is a sure-fire way to deaden and demoralise your science base. This is what the biologist Steve Jones is talking about when he talks about the “Sovietisation” of contemporary western science. Tom Hunter: Back to the book, and for all its flaws and politically biased research and so forth, it seems this period in Russian history is, in many ways, as culturally influential as other great periods of human development — the Renaissance perhaps, or the Industrial Revolution or the first Space age — and is worthy of far more critical attention than it might perhaps have received? Simon Ings: It’s true to say the Cold War has done historians no favours, and there is much about this place and this period that’s still to enter the public consciousness. I reckon Stalin and the Scientists might, with a following wind, make a chink in the wall. But it’s a bloody big wall. No sooner are the archives being opened up to international researchers than Putinist academics are asserting their own politically motivated versions of Stalinist “successes”, hence various recent attempts to recast the charlatan Trofim Lysenko as a pioneering epigeneticist. Which, while we’re on the subject, is rather like saying that someone who believes in mermaids is a marine biologist. The biggest difficulty for an outsider, and especially for a non-academic outsider like me, is to get enough perspective to be able to distinguish between scientific troubles and political ones, during a time when the two spheres were deliberately and sincerely run together in speech and practice. I’ve really just introduced the problem to a popular audience. There’s much more heavy lifting to do. Tom Hunter: And finally, as Culture Editor for New Scientist is your job effectively to reconnect the arts and the sciences, and if you dare which side do you think has to do the most work to make that happen? Simon Ings: I am a great believer in CP Snow’s Two Cultures and a firm champion of them both. Long may they continue, distinct and separate. What we want is not fusion or collaboration, but conversation. And for that conversation to be worthwhile, it’s necessary for both parties to be awake. We can no longer afford to indulge an arts base that remains wilfully disengaged from the great and besetting problems of our age. Science can’t be expected to do all the heavy lifting and it really is time the humanities climbed out of their Deleuzian oubliette and read some Stanislaw Lem (anything, but especially the Summa), some Amitav Ghosh (The Great Derangement will do) even some object-orientated ontology (try Graham Harman’s Immaterialism). Intellectually, those of us who are not scientists need to toughen up and stand on our own two feet. We have a job to do. Culturally there’s a lot to play for in the next fifty years of human habitation on this planet — and everything to lose. 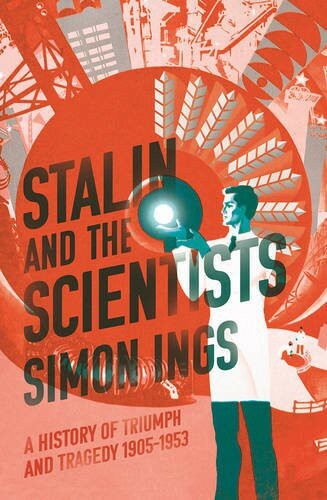 Stalin and the Scientists by Simon Ings, is published on 6 October by Faber & Faber. If you enjoyed this interview and would like to see more of the same, please do click the heart-shaped button below and help us boost the signal. You can keep up to date with all the latest news from the Arthur C. Clarke Award by signing up to our newsletter here.